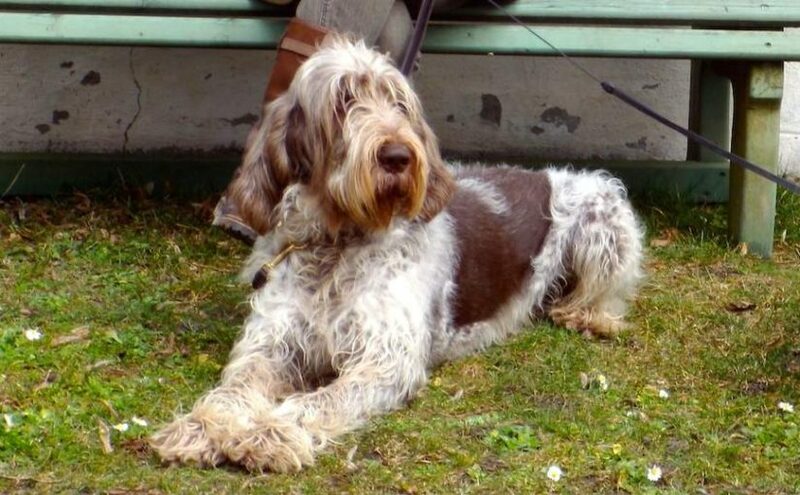 Spinone Italiano (Italian Spinoni) is a large rugged coarse-haired dog breed of distinctive appearance. 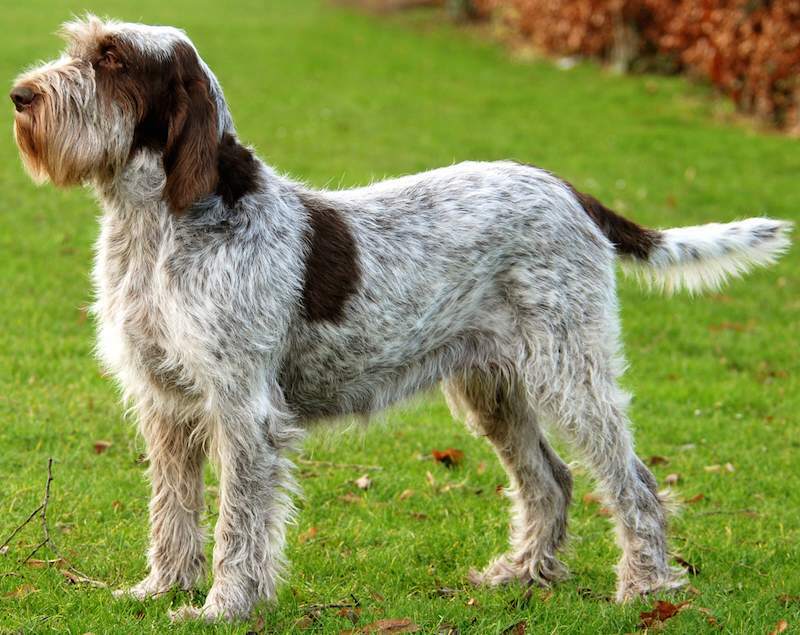 The Spinone Italiano was developed as an all-around gun dog whose specialty is working in marshy and wooded areas. A versatile hunting dog of ancient lineage, his origins are in northern Italy. 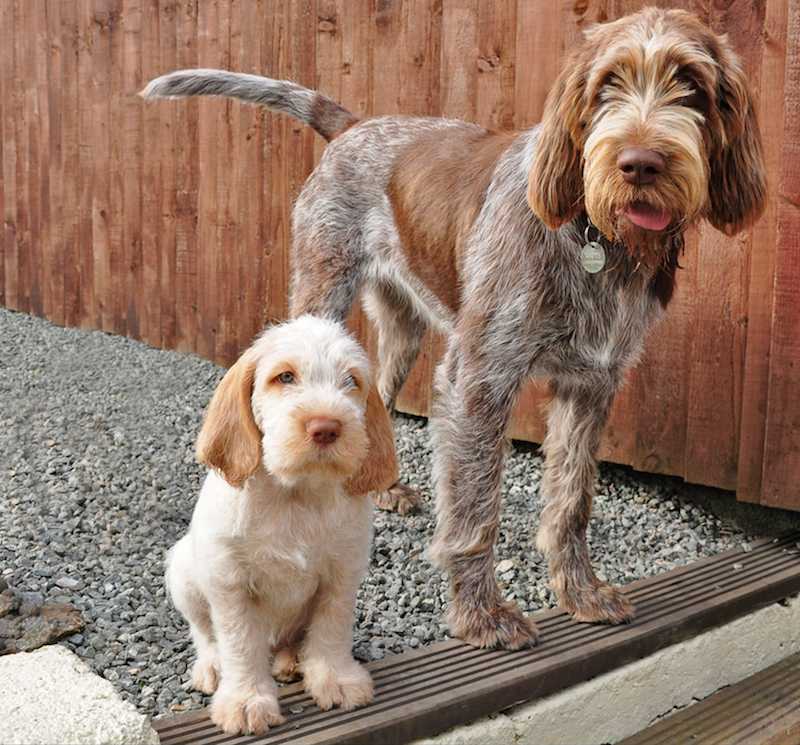 The Spinone Italiano is a mixture of several sporting breeds such as the French Pointer, the French Griffon, the Barbet, the Porcelaine and the German Wire-haired Pointer. Spinone is more hound-like in appearance. Once in danger of fading from the scene, the Spinone Italiano enjoyed renewed interest when the Italian Kennel Club came to his rescue. 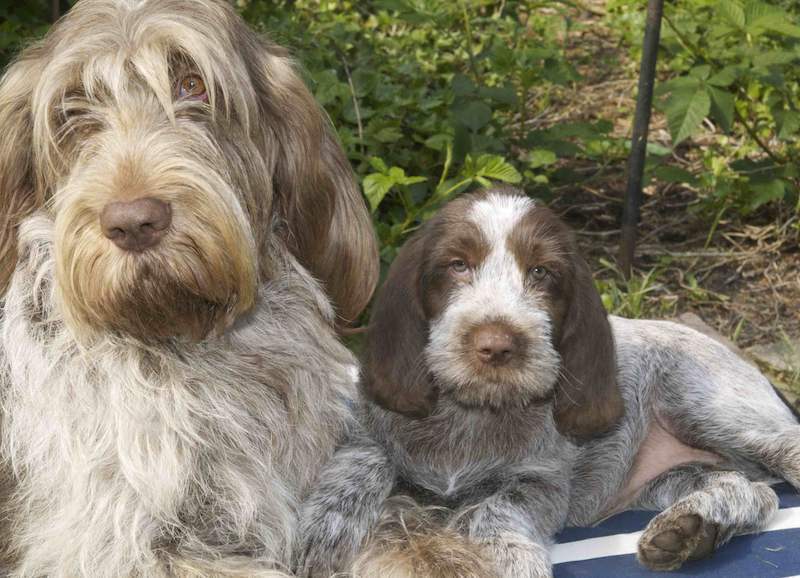 The Spinone Italiano dog breed has recently been recognised by the AKC. Spinone Italiano Temperament and General Appearance: The Spinone Italiano dog breed’s expression is a direct line to its temperament. The distinguished, well-salted great grandfather look indicates that this is a noble, wise and protective canine companion. He can either be reserved or rowdy and playful. Dog of solid construction, robust and vigorous; powerful bone; well-developed muscles, hair rough. Important Proportions: His build tends to fit into a square. The length of the body is equal to the height at the withers, with a tolerance of 3/8 to 3/4 inches (1 to 2 cm) longer. The length of the head is equal to 4/10ths of the height at the withers. Its width, measured at level of the zygomatic arches, is inferior to half its length. Coat & Colour: Coat: hair of a length of 1 1/2 to 2 1/2 inches (4 to 6 cm) on the body, shorter on the muzzle, the head, the ears, the front sides of the legs and the feet. On the back sides of the legs, the hair is like a rough brush, but never with fringes. Long and stiff hair garnishes the eyebrows and the lips forming thick eyebrows, moustache and tufted beard. The hair is stiff, harsh, dense and rather flat, with lack of undercoat. Colour: Pure white, white with orange markings, white speckled with orange, white with brown (chestnut) markings, roan or brown roan (chestnut). The preferred shade of brown is the colour of “Friar’s frock”. Not permitted colours are: tricolour, tan markings, black in any combinations. Head: The direction of the upper longitudinal axes of the skull and muzzle is divergent. Skull: of oval shape; its lateral walls gently sloping like a roof, with occipital protuberance very well developed and parietal crest well marked. The bulge of the forehead is not very developed, not towards the front or in height. The superciliary arches are not too prominent. Stop: barely marked, whereas the medial-frontal furrow is very pronounced. Nose: in the prolongation of the nasal bridge, voluminous, spongy in appearance with a very thick and distinctly rounded upper edge; of pink flesh colour in white subjects; a bit darker in the white and orange subjects, chestnut brown in the chestnut roan subjects. In profile, the nose protrudes over the forward vertical line of the lips. Nostrils are large and protruding. Muzzle: its length is equal to the length of the skull; its depth, measured at mid length, reaches a third of its length. The profile of the muzzle is straight or slightly convex (Roman nose). The lateral faces of the muzzle are parallel, so that, seen from the front, the muzzle appears square shaped. The lower profile of the muzzle is defined by that of the upper lip; its lowest point is the labial commissure. Lips: the upper lips, rather fine, form an open angle below the nose; in their forward part, they are rounded, then, covering the lower lips, they reach the labial commissure where they form a visible fold. Jaws/Teeth: powerful and normally developed, at mid-length the branches of the lower jaw are very lightly curved. Dental arches well adapted; incisors articulate either in scissor or pincer bite. Cheeks: lean. Eyes: large, well opened and set well apart. The eye is almost round; the lids closely fitting the eye which is neither protruding nor deep set; both eyes are on an almost frontal plane. The iris is of an ochre colour, more or less dark according to the colour of the coat. Leathers: practically triangular in shape; in length they are not more than 5 cm longer than the lower line of the throat; in width they reach forward from the point of onset of the head to the neck to the middle of the zygomatic arch. The forward edge is close to the cheek, not folded, but turned inwards; the tip of the ear is slightly rounded. Nearly always carried low, the ear should have little erection power. Cartilage is fine. The skin is covered with dense hair mixed with longer scattered hairs, which become thicker at the edges. Neck: Powerful and muscled, clearly set off from the nape, merging harmoniously into the shoulders. Its length must not be inferior to 2/3 of the length of the head; its circumference reaches a third of the height at the withers. The lower edge shows a lightly developed double dewlap. Forequarters: Seen from the front, they are perfectly parallel and perpendicular to the ground. Seen in profile, the forearm is vertical and the metacarpus is slightly oblique. Shoulder: shoulder blade powerful and long, measures a quarter of the height at the withers, and has an obliqueness below the horizontal of about 50°; in relation to the median plane of the body, the points of the shoulder blades are not very close. Perfectly free in its movements, the shoulder has well-developed muscles; the opening of the scapular-humeral angle is of about 105°. Upper Arm: oblique below the horizontal with a slant of about 60°, directed almost parallel to the median axis of the body. It is well muscled. Elbows: in parallel plane to the median plane of the body. The point of the elbow must be a little forward of the vertical line which drops from the posterior point of the shoulder blade to the ground. The distance from the elbow to the ground is equal to 50% of the height at the withers. Forearm: slightly longer than one-third of the height at the withers, vertical seen from the front as well as in profile. Strong bones. The hind tendon is strongly accentuated in such a way that the groove between tendon and bone is clearly visible. Pastern Joint: follows the vertical line of the forearm. Pastern: flat, and, seen from the front, follows the vertical line of the forearm; seen in profile, it is slightly oblique. Its length is of about 1/6 of the height of the leg to the elbow. Forefeet: compact, round; toes well-knit and arched, covered with short thick hair, including the spaces between the toes. The pads lean and hard are more or less pigmented according to the colour of the coat. Nails strong, curved towards the ground and well pigmented but never black. Body Fits almost into a square. Upper Profile: the upper profile of the back is made up of two segments: the first, nearly straight, slopes from the withers to the 11th dorsal vertebra, and the other, slightly convex, joins with the solid and well arched lumbar region. Withers: not too raised. Loin: slightly convex, has well-developed muscles in width. It measures in length a little less than a fifth of the height at the withers and its width is almost equal to its length. Rump: wide, long, well muscled and oblique, forms below the horizontal an angle of 30° to 35° which is measured of the obliqueness of the hip bone. Chest: descends to at least the level of the elbows, is broad, deep and well rounded at mid height, where its transversal diameter reaches its maximum and decreases perceptibly in direction of the sternum, but without the chest forming a keel at the junction with the sternum. The ribs are well sprung and slanting with wide spaces between ribs. The back ribs (false ribs) are long, oblique and well opened. Lower Profile: almost horizontal in the sternal region, then ascends slightly towards the belly. Hindquarters: Seen in profile, back edge of the buttock is slightly convex; good angulation of the bone segments; the hocks must be perpendicular to the ground; seen from behind, the hindquarters are parallel and perpendicular to the ground. Upper Thigh: Its length must not be inferior to a third of the height at the withers. Its width is 3/4 of its length. Strongly muscled. Its direction is slightly oblique from top to bottom and from back to front. Its back edge slightly convex. Lower Thigh: its length exceeds just slightly that of the upper thigh; its obliqueness is of 55° – 60° below the horizontal; lean muscles in its upper part; the furrow between the Achilles tendon and the bone is marked and clearly visible. Hock Joint: its lateral sides are very broad. The distance between the point of the hock and the ground is about one-third of the height at the withers. The opening of the angle of the tibial tarsal articulation is about 150°. Hock: strong and lean, its length is equal to the distance from the hock to the ground. Observed from whichever side, the metatarsal is vertical. On its inner side there may be a simple articulated dewclaw. Hind feet: showing all the same characteristics of the front feet, but slightly more oval. Tail: Docked: Thick particularly at its base, carried either horizontally or down, there are no fringes. It should be docked leaving 6 to 10 inches (15 to 25 cm). Undocked: Thick particularly at its base, set on as a continuation of the croup and carried horizontally or down, no fringes. Gait Easy loose step; when hunting, extended fast trot with intermittent paces of galloping. Disqualification: Upper cranial-facial axes convergent. ; Total depigmentation of the nose ; Concave nasal bridge. ; Overshot or accentuated undershot mouth. ; Wall eye. ; Black pigmentation of the skin or the mucous membranes. ; Coat tricoloured, tan markings, black in all combinations.